UCU - When is a pay rise not a pay rise? When is a pay rise not a pay rise? That is precisely what has happened to staff working in higher education in every year from 2009 to 2013. Only in 2014, when UCU members took significant and sustained action in the face of yet another real-terms pay cut was a better offer forthcoming from your employers. People working in higher education are feeling the squeeze and the facts are stark. 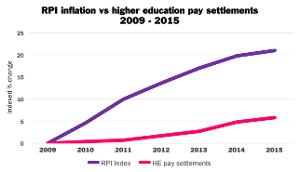 The cumulative loss to your pay since 2009 when compared to rises in RPI inflation is 14.5% and with economists predicting the return of inflationary pressure in the coming months, the higher education pay gap is only set to grow. If you have not already done so, please take a few moments to try out our 'Rate for the Job' tool - which now includes a new tab for hourly paid staff - and see the difference that these below-inflation pay rises have made to you. UCU is clear that it's high time our universities started investing in their biggest asset - you and your colleagues. 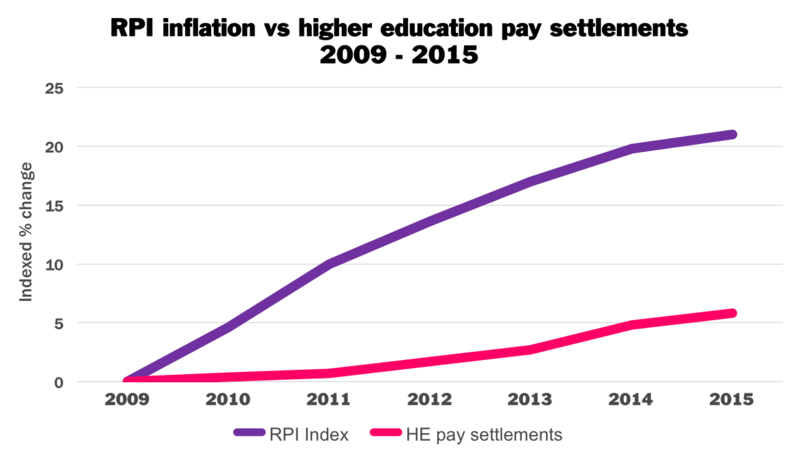 And with the news this week that universities in England have recorded a record surplus, it is clear that the money for a fair deal is there. Together we can make 2016 the year we unite and fight to win a fair rate for the job, so please share this message with your colleagues and encourage them to join UCU.